This past Sunday morning, the sportscasting world lost one of its most talented and inspirational sports anchors. Stuart Orlando Scott, also known by his colleagues as “Stu,” passed away Sunday morning due to his battle with cancer. He was 49-years old. Many in the sports and entertainment world paid their respects to the legendary sportscaster in a series of tweets, heart felt interviews from fellow ESPN colleagues, and even a tribute from President Barack Obama himself. All of this from a guy who did nothing but revolutionize the way sports journalism was written and reported on air. His style made him immediately stand out from his contemporaries not just because he was an African-American; but because he wasn’t afraid to show it in his style, demeanor and of course; his distinct vocabulary. With catch phrases like “Holla at a playa when you see him in the street,” even down to his signature expression, “Boo-Yah;” Scott instantly became a game changer as he continued to push the envelope so much that he deserved his own U.S. postal stamp. There is much more I could go on and practically repeat what other’s have already written about Scott these last several days. However, there is one aspect of Stuart Scott that I don’t mind repeating what others have written and included into their blog’s newspaper’s and publications. 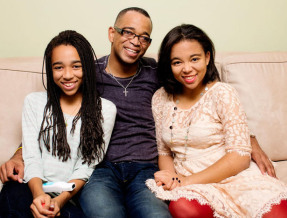 It is the aspect of how much Stuart Scott loved being a father. Shortly after his speech, Scott invited his youngest daughter Sydni to the stage and he affectionately embraced her to crystallize an indelible moment. It was from then on that myself and America was privileged to witness the other side of a man beyond his amazing talents as a anchor and a sportswriter. We got to experience a black father’s love and adoration for his children. See in the black community, the word ‘Dad’ or ‘Father’ has always been associated with words like absenteeism, deadbeat, and the most haunting seven words a child should never hear: “You’re just like your no good father.” I understand there’s certainly a segment of black men in America who are definitely guilty as charged when it comes to these labels. For many of them, fatherhood is nothing more than a generational curse soon to be passed on once he hears from the female he’s been involved with these unsettling words: “i’m pregnant.” Likewise, for that same young woman who finds out that she has become pregnant from the boyfriend (who she thought loved her) but was nothing more than a emotional substitution to fill that attention void she’d never received from her own father. That is why, in my opinion, what Stuart Scott did that fateful night in honoring his daughters in front of the world; was equally important as the determination it took for him to get there. In days leading to the event, Scott suffered liver complications, kidney failure, and endured four surgeries in a span of seven days. Some will read this article and might come away thinking “it’s not about race” or that i’m selfish for even bringing it up in the wake of Scott’s passing. My riposte of that would be well what if Stuart Scott was afraid to be or never became Stuart Scott? What if Stuart Scott would have stuck to the prototypical, docile-assimilated, black man that many corporations are filled with today? What if Stuart Scott never stood up to his executives’ at ESPN who at one time were grossly offended by the very same lexicon that made Scott so beloved as an icon in sports television today? Stuart Scott spoke the language of his people because he was never ashamed of who he was; thus he wasn’t afraid to be who he was either. Contrary to popular belief, Stuart Scott didn’t have to “Carlton Banks” himself to the top of the ranks at ESPN. (I’ll let y’all think about that for a moment) Scott exuded excellence in his craft and his sports acumen was among the best in his profession. However, all of his greatness aside; this writer only wanted to merely highlight a scintilla aspect of Scott’s life as a father hoping it will transcend the negative stereotypes that is placed on black fathers in the general. So in closing, in order for us to change the narrative of the deadbeat, absentee father; we must embrace and promote the positive images of the fathers who are actively involved–and faithfully present. You can only work on that which you have the power to control.